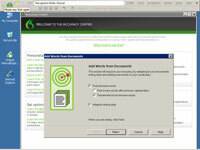 At this step, you provide your NaturallySpeaking assistant with documents so that it can look at them and pick out any words or capitalized phrases it doesn’t recognize. The more documents you give Vocabulary Builder, the better. In particular, give it documents that resemble the documents you want to dictate — your previous best-seller, for example, or a collection of your office memos. 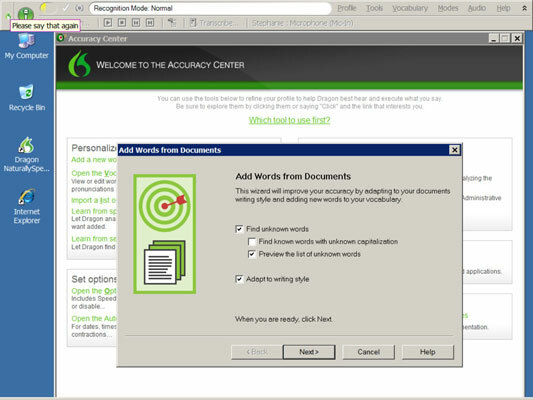 1From the Accuracy Center, click the Learn from Specific Document link or choose Vocabulary→Learn from Specific Document from the DragonBar. An Add Words from Documents screen pops up. On this screen, you have the option to Find Unknown Words (in various forms) or Adapt to Writing Style. 2Click the check box next to each option you want to add and then click Next. A new screen appears with buttons to add either folders of documents or single documents to analyze. 3Click the buttons to add your files. Your Windows Browse window opens, allowing you to choose the files as you normally do. Next the files show up in the window of the Add Words from Documents screen. Your documents are analyzed. A check mark appears next to the names of the documents analyzed. All the words that were new to your vocabulary are shown with check marks and the frequency with which they occurred. 5If you want to add all the words on the list, click Next. You see a list of the words and the screen asks you to check the words you want to train. 6Check the ones you think should be trained for pronunciation. The Train Words dialog box displays, in large type, the written form of the term. Speak the phrase into your microphone exactly as you would say it. A Summary box shows you how many words were added to your vocabulary.